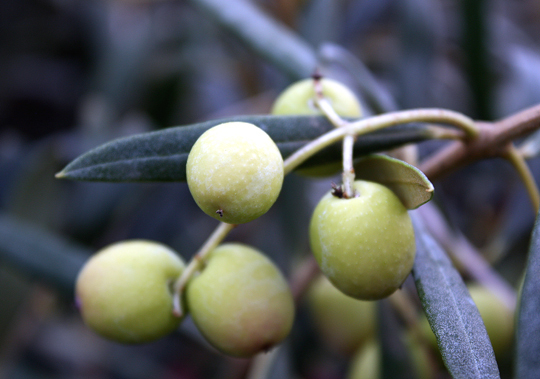 Like wines, olive oils have a myriad of flavors and aromas. The more robust tasting the olive oil — with an intense bitterness and astringency on the nose and palate — the more antioxidants it has. It also will keep longer — even five years — than milder tasting olive oils, which should be consumed within a few months of pressing. Use pungent extra virgin olive oils when you want them to be the focal point, such as in salads or as a finishing touch to dishes or just to dunk chunks of crusty bread in. 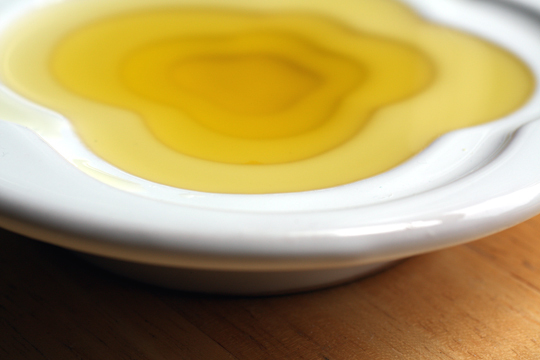 Use mild olive oils in cooking when you don’t want its flavor to dominate. Those were among the olive oil lessons I learned on my recent trip to Australia with a small group of food journalists. We were guests of Boundary Bend Ltd., which makes Australia’s premier extra virgin olive oils under its Cobram Estate label. One of the highlights of the trip was getting to taste a variety of just-pressed oils. After choosing our favorite varietal, we were each given a precious little bottle to take home. 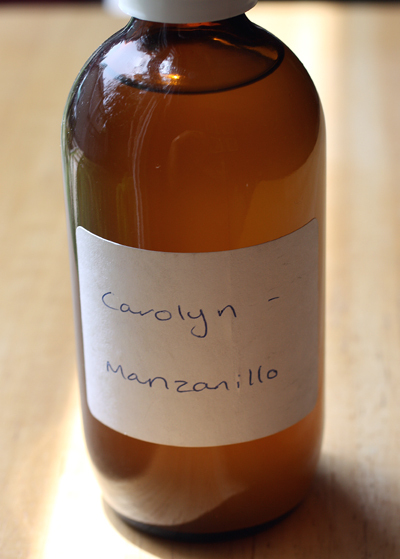 While most of my colleagues opted for the more potent tasting oils, I chose the Manzanillo, a more delicate, fruity, and almost creamy tasting oil with the intriguing scent of strawberry jam. My hosts said it was ideal for baking. And they were correct, as it tasted lovely in the “Olive Oil and Sherry Pound Cake” that I made when I returned home. 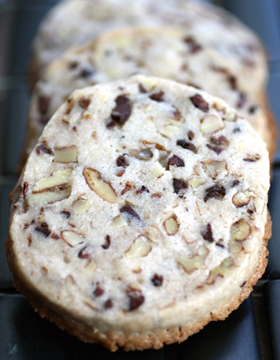 The recipe is from “Pure Dessert” (Artisan) by Berkeley’s renowned baker, Alice Medrich. A whole cup of extra virgin olive oil, as well as a cup of sherry, goes into the batter. 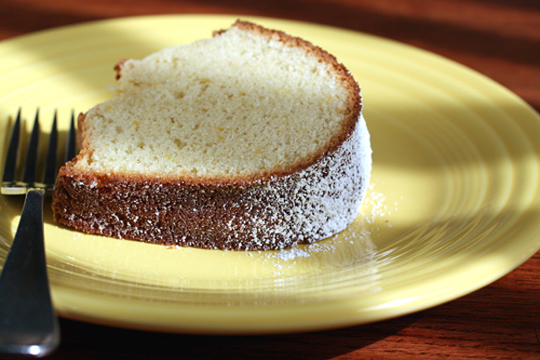 Olive oil cakes tend to bake up super moist, and this one was no exception. 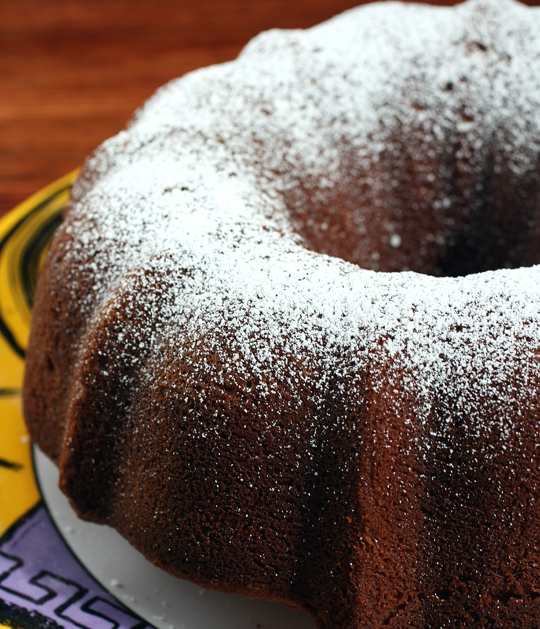 Do as I did, if you like, and dust the top of the cake with a shower of powdered sugar before serving. This is a classic cake with a subtle complexity and richness from the olive oil, as well as a whisper of nuttiness from the sherry and a zing of citrus from grated orange zest. It proved a most fitting finale for my coveted Australian souvenir. 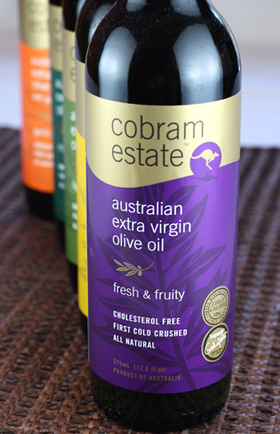 Food Gal Contest: How would you like to win your own bottles of award-winning Cobram Estate extra virgin olive oils from Australia? Four lucky Food Gal readers will be able to do just that. Each will win a box of five bottles — one each of Cobram Estate’s “Light & Delicate,” ”Fresh & Fruity,” “Rich & Robust,” “Lemon Twist,” and “Garlic Crush” extra virgin olive oil blends. The contest is open only to those in the continental United States. Deadline to enter is the end of the day, July 17. The four winners will be announced July 19. Mix flour, baking powder, and salt thoroughly in a large bowl and sift together. Set aside. In the bowl of a stand mixer (with the whisk attachment if you have one), beat the sugar, oil, and orange zest on high speed until well blended. Add eggs one at a time, beating well after each addition; continue to beat until the mixture is thick and pale, 3 to 5 minutes. Stop mixer and add one-third of the flour mixture. Beat on low speed just until blended. Stop the mixer and add one-third of the flour mixture. Beat on low speed just until blended. Stop the mixer and add half the sherry. Beat just until blended. Repeat with another third of the flour, followed by the remaining sherry, and then the remaining flour. Scrape batter into pan(s). Bake until cake tester comes out clean, 50 to 60 minutes for either the tube pan or the loaves. Cool cake in the pan(s) on a rack for about 15 minutes before unmolding. If using a tube pan, slide a skewer around the tube. If the sides of the pan are straight, slide a thin knife or spatula around the sides to release the cake (unless lined with paper). If using a Bundt or other decorative pan, tap one side of the pan against the counter to release the cake, then tap the other side. Invert the cake onto a rack. Turn the preferred side up before cooling the cake completely. 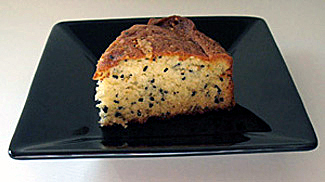 Wrapped airtight, the cake keeps well at room temperature for up to 3 days, or freeze for up to 3 months.